Babcock saved his best for last. Ultiworld’s reporting on the Men’s division of the 2017 D-III College Championships is presented by Spin Ultimate; all opinions are those of the author. Please support the brands that make Ultiworld possible and shop at Spin Ultimate! When you read through the nominations for the Donovan Award, you can’t help but notice how important individual players can be to teams in Division III. D-III programs are smaller, have access to fewer resources, and, in some cases, lack the necessary leadership and vision to become elite. The 2017 Donovan Award winner Henry Babcock’s vision for the Richmond Spidermonkeys was based largely around a simple principle: hard work would pay off. “His work ethic, his dedication, and his intensity were an inspiration to everyone including myself,” said head coach Matt Graves after the final. Talking to Graves throughout the season and throughout Nationals this weekend, there’s a sense that Richmond’s depth and core desire to win a national championship were the direct consequences of Babcock’s leadership since he came into the program in 2013. Developing depth in a program that managed to attract several talented players was the focus of Richmond during his tenure as a captain. Richmond’s journey to a title was never a foregone conclusion. In 2016, they came in as a potential contender only to see their hopes dashed quickly in pool play. In the fall, veteran cutter Joey Cullison tore his ACL, sending Richmond into somewhat uncharted waters for the spring season. Despite a high profile win over Harvard at Queen City Tune Up, Richmond’s regular season was marred by two losses to Dartmouth and Davidson, the team they’d ultimately face in the final. Setting the tone with the program carried over for Babcock into game time. “Last year at nationals we didn’t have that energy and emotion you need to win this tournament,” said Babcock. In the heat of the moment on Sunday, Babcock’s will to get his team to a title manifested itself in the adversity Richmond faced against Bryant’s defense and Davidson’s refusal to quit in the final. It’s easy to underestimate the effect that a player viewed as a role model by their teammates can have on a program. At a tournament that has been defined in recent years by the individual performances of some of the best handlers in the division, it would ultimately fall to Babcock to propel his team to a championship. The value of Babcock on the field was evident enough in the semis. With Bryant playing a box-and-one to take out Chris Selwood, Babcock was shifted onto offense for the first time all tournament. In the rain and facing the teeth of Bryant’s zone looks, Babcock worked hard to peel apart the first layers of Bryant’s athletic marks, demonstrating a poise and confidence with the disc evocative of the best D-I handlers. It was in the final, however, where Babcock’s performance demonstrated his all-around skillset. Richmond’s shaky start ended with Babcock playing both ways again. Whether it was setting up Richmond’s defense with excellent pulls, working the disc on a turn, or pinpointing throws into the endzone, Babcock’s steady hand allowed Richmond to survive swings in momentum during the final. Babcock finished the final with six assists, two goals, and three blocks. 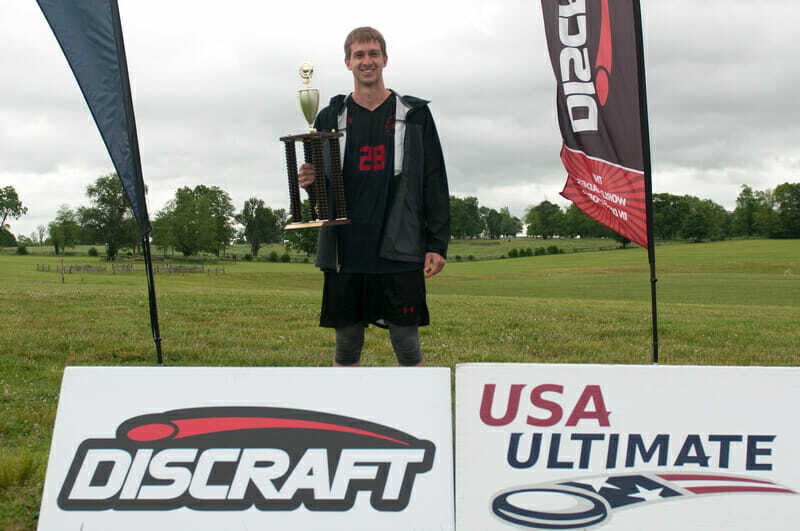 It was an inspiring performance from the senior who capped off Nationals as the tournament assist leader (25). For a player who didn’t cross over to offense until the last two games of the weekend, it was a decisive performance to cap off an outstanding career. There was no overwhelming sense that Henry Babcock would win the Donovan award this year. Sure, he was a high profile player widely respected in a very competitive region. But before nationals, a legitimate case could be made for any of the Donovan finalists. But after the final point was scored and Richmond was celebrating their first ever program title, there was very little doubt who the best player in the division was in 2017. In a world where the power of a great highlight reel can land you a shot at an MVP nod, it was refreshing to see the award go to a player who, from the start of the 2017 season, was the best player in the Division. Comments on "Hard Work Pays Off: Henry Babcock Delivers A Title And A Donovan"